Your trust is something we want to keep. Being a Child Care provider, there is nothing more important to us to be confident and to keep doing what we do than the continued faith placed in us by our number one resource – the parents. We understand how difficult it must have been for you to leave your little ones in the hands of strangers. But once you come to know us, you will take comfort in the home-like environment we give and the family-like love we provide to your kids within a full day of fun and play. 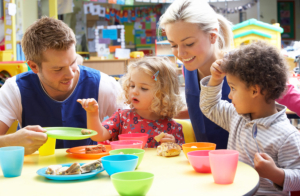 Hylan Daycare, Inc. is staffed with the most qualified child care specialists, licensed teachers, music together specialists, and a whole team of supportive day care professionals. Our staff are all certified in Basic Life Support, Pediatric CPR, and First Aid. When your child is with us, you can indeed rest with peace of mind, knowing that your little loved ones are in safe keeping. We would be more than happy to know more about you, too. Please do visit us whenever convenient during school hours and we can show you around and introduce you to the day care staff. Simply call 718-351-2705 to set an appointment or use our online contact form to send us your request details.